Product prices and availability are accurate as of 2019-04-14 09:47:33 UTC and are subject to change. Any price and availability information displayed on http://www.amazon.com/ at the time of purchase will apply to the purchase of this product. Grab the durable, wooden handle of the TEKTON 4 in. Taping Knife (Stiff) and tape wallboard joints time and time again. A light gauge, flexible, tempered steel blade allows for better control when spreading and feathering compound. 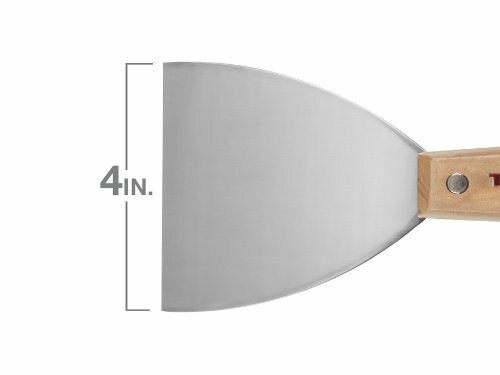 The hardwood handle features a full tang, double-riveted construction, which ensures this tool will hold up. Once the job is done, clean-up is made easier due to the rust-resistant coating on the blade. 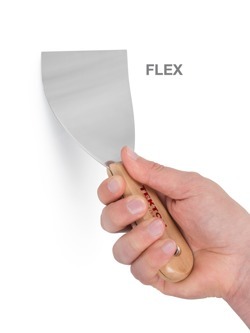 And since it’s TEKTON, this putty knife is always guaranteed. So go ahead, Take It On. Light gauge flexible blade spreads material with more control (view larger). 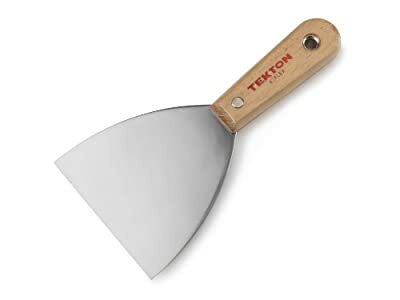 The TEKTON 4-inch flexible putty knife smoothly spreads putty and patching compounds, as well as scrapes off old, flaking finishes. Made of spring tempered steel, the flexible, light gauge blade is mirror polished to apply a smooth finish. Comfortable hardwood handle grips are double-riveted to the full tang blade forming a strong, durable construction. Our philosophy: world-class support for the price of a tool. We want you to spend time on your project, not talking to us. So we strive to provide tools and support that consistently exceed expectations. If you need a replacement tool or part for your TEKTON product or have a product support question for us, simply call 888-648-3371 to reach a TEKTON support specialist in Grand Rapids, Michigan or email support@tektontools.com. In ancient Greece, a "tekton" was an artisan, a builder, a doer. Sound familiar? Whatever comes along, your instinct is to take it on. TEKTON hand tools are made for the serious tool user, who takes on life's projects with gusto, but without an unlimited budget. For the price of a basic hand tool, we provide well-designed tools and hassle-free support that consistently exceed expectations. What's more, we work hard every day to listen to your feedback to continually improve our products. Build it, fix it, remodel it, or restore it — whatever there is to do, pick up TEKTON and Take It On. Which TEKTON Putty Knife Is Right For You?